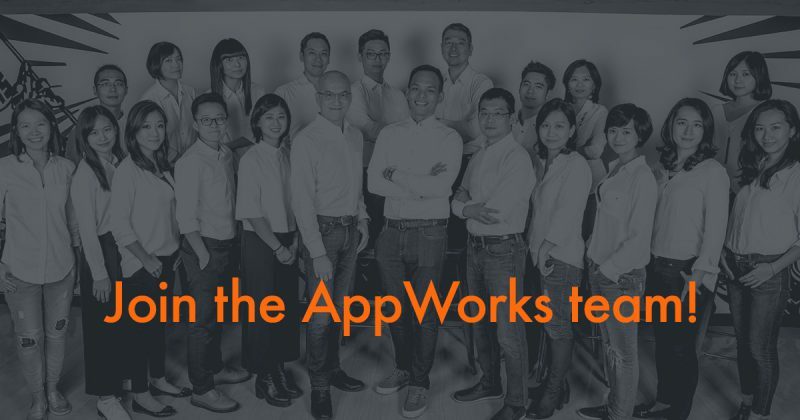 AppWorks was started by Jamie in 2010 to give Taiwan a push as it upgrades itself into a 21st-century digital economy and to connect Taiwan with ASEAN to form a collaborative Greater Southeast Asia ecosystem. Today, AppWorks is the region’s leading startup accelerator and early-stage VC. AppWorks Accelerator, the renowned 6-month free accelerator program, now admits 30 startups per batch from across the region and boasts 328 active startups and 925 founders in our alumni network. Well known startups such as EZTABLE, NetPublishing (隆中網絡), KuoBrothers (創業家兄弟), 91APP, KKday, Morning Shop (早餐吃麥片), AsiaYo and ShopBack are all members in this community. At AppWorks, you will contribute directly to the fast-growing AppWorks Ecosystem. You will have access to AppWorks Founders and CEOs, many of whom are on their way to becoming leaders in the business community. Team AppWorks is a group of self-starters. We manage our own time and we deliver. We work together in a great environment with abundant learning opportunities. We strive to improve and become better versions of ourselves every day. We welcome you to join the team and be our coworker. Associates are the ones that make things happen at AppWorks. This position will offer first-hand experience making VC investments and advising startups. Your core responsibility is to manage full life cycles of our investments — from pre-investment research, forming theses, due diligence, structuring deals, closing process, post-investment tracking, adding value all the way to exits. You will also be contributing to the AppWorks Ecosystem and taking on new initiatives. We’re looking for an Analyst to join AppWorks to help drive investments and contribute to the AppWorks ecosystem. We are a leading startup accelerator and one of the most active early-stage VCs in Asia. AppWorks is created by founders for founders. We like to get deeply involved with startup teams to provide expertise and strategic value. This position will offer first-hand experience making VC investments and advising startups. Actively and publicly share insights about the startup ecosystem in Taiwan. See first hand how AppWorks, the leading startup accelerator & VC in Greater Southeast Asia, actually operates. Learn how to pull off an event attended by 1,000 people — our renowned semi-annual Demo Day. Conduct research and due diligence for VC deals and investment-related projects. Gain access to AppWorks Partners, Associates, Analysts, and Masters. Meet a ton of aspiring startup founders, from Taiwan, Southeast Asia, and around the world. Prepare yourself for a successful career in the startup land.